Habit: Annual. Stem: generally erect, 1--15 dm, sometimes +- red or purple. Leaf: sheath papillate-hairy; ligule 1--3 mm, entire to jagged; blade 5--30 cm, 3--20 mm wide. Inflorescence: 3--20 cm; branches generally ascending, lower 5--10 cm. 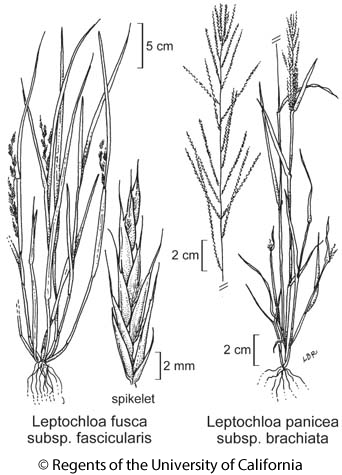 Spikelet: 1--3 mm, compressed; glumes 1--2 mm, +- equal, +- purple; florets (2)3--4; lemma 1--2 mm, keeled, veins hairy, tip minutely 2-lobed, awn 0. Chromosomes: 2n=20. Citation for this treatment: James P. Smith, Jr. 2012, Leptochloa panicea subsp. brachiata, in Jepson Flora Project (eds.) Jepson eFlora, http://ucjeps.berkeley.edu/eflora/eflora_display.php?tid=77085, accessed on April 23, 2019. No expert verified images found for Leptochloa panicea subsp. brachiata.